The inspiration behind this came from Loops and Threads Woolike yarn. When I saw their beautiful fall colors about a year ago, I fell in love. And since it’s a thinner yarn, front post stitches came to mind to create a nice thick fabric with lots of color design. And this is the design that I came up with using the gorgeous fall colors. At first I was going to name it something with fall, but then realized there was a million other things I could do with the stitch, so it became the seasonal stitch instead. This is not a new stitch. 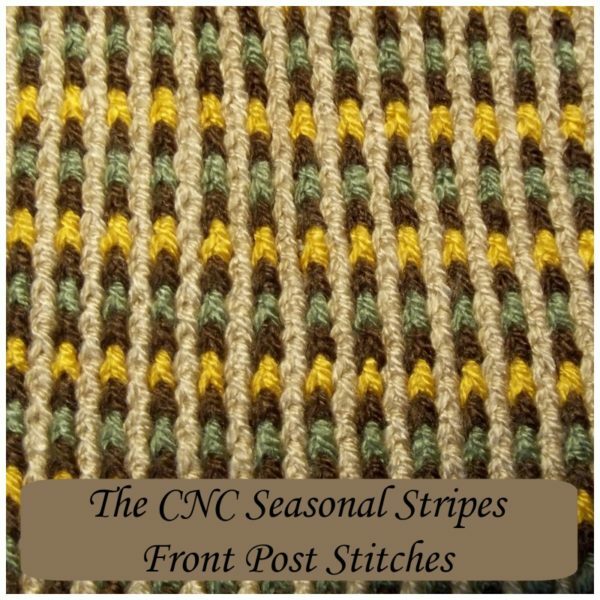 The fabric is simply worked with front post stitches and chain one spaces to create a beautiful color design. 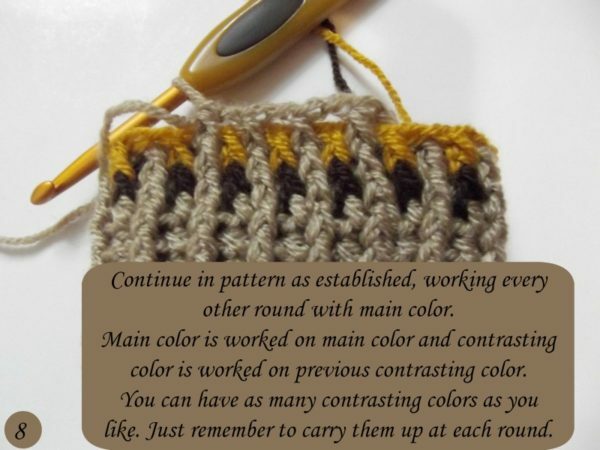 This is a short tutorial on how I start the rounds, how the colors are worked with the main and contrasting colors, as well as how to carry the yarn up at each round. There are a million different things you can do in regards to color combinations, so feel free to experiment as you like. For this pattern you will be working with a main color as well as contrasting colors. The main color is worked in every other row, whereas the contrasting colors can be changed up as you like. 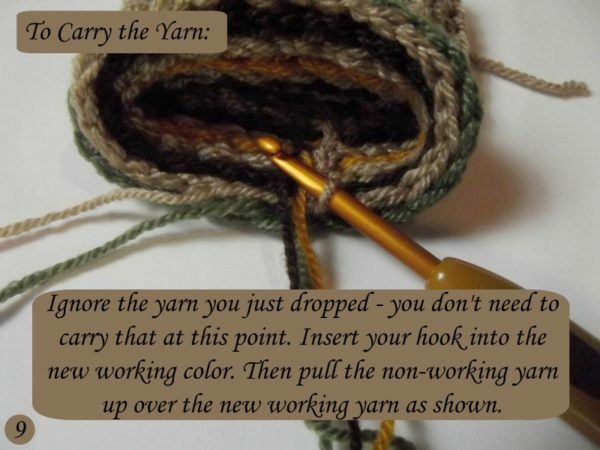 You will need to carry your yarn up at each round, and I’ve included to images on that towards the very end. 1.) To start the pattern, I worked my rounds of ribbing until desired height. Then to begin the cool stripes I continued the first round with the main color. 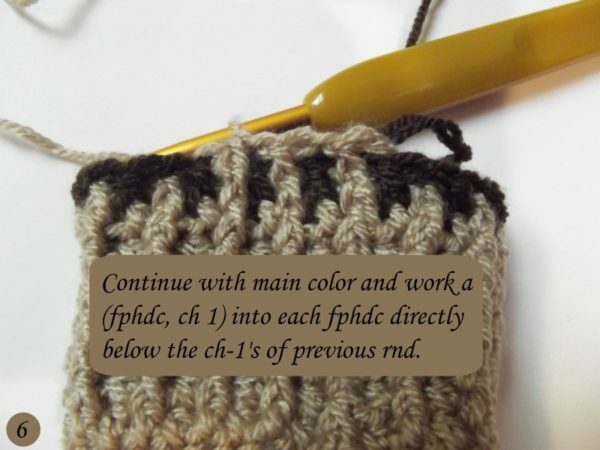 The stitch pattern is a (fphdc, ch 1) in every other stitch around. Join the round and drop the main color. 3.) 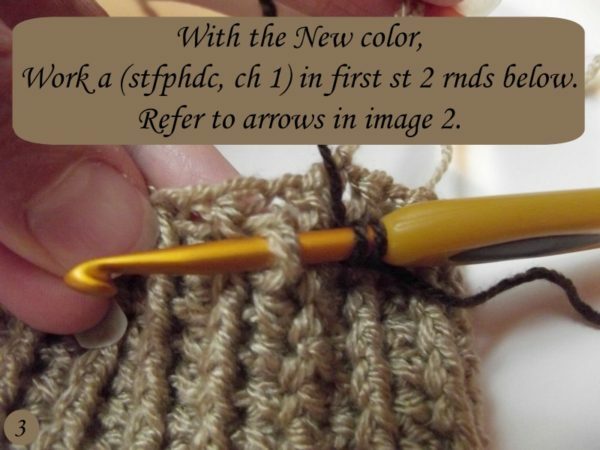 With the main color dropped at the back, I joined the new color with a standing crochet stitch – a standing front post half double crochet, to be exact. 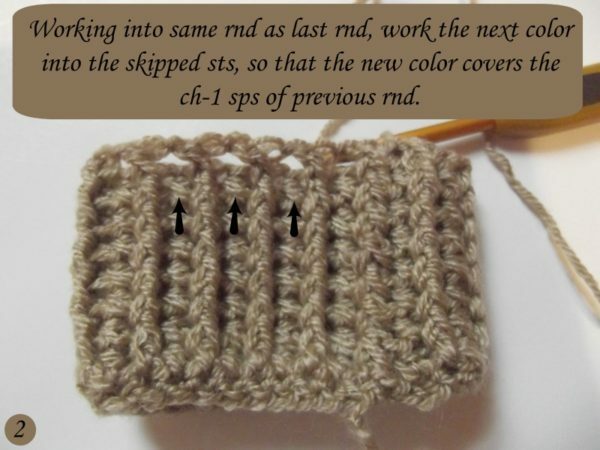 Please refer to this tutorial on how to work your standing crochet stitches. 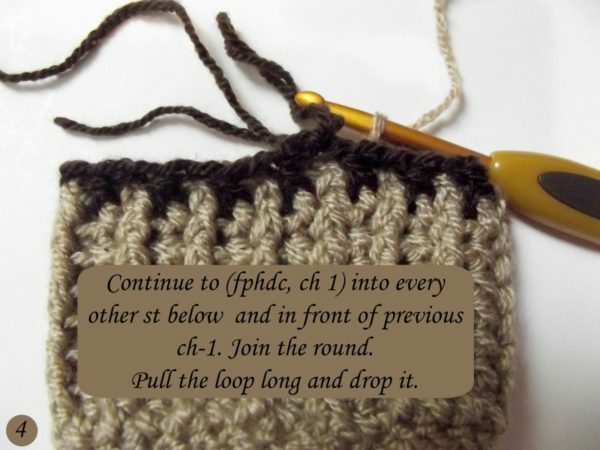 The stitch pattern is the same, you work a (fphdc, ch 1) into every other stitch two rounds below. 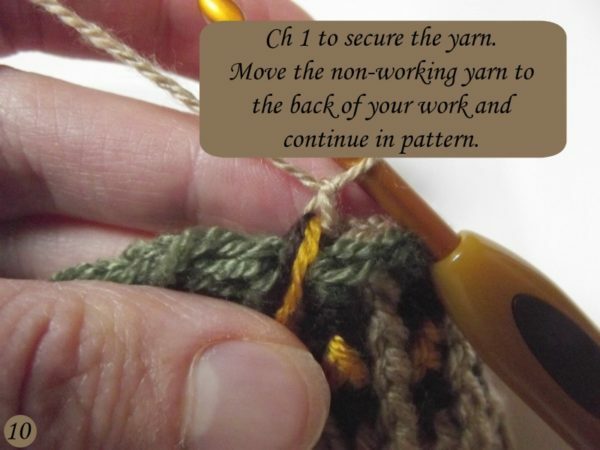 To make it easy, starting at this round and onward, you always work the next round directly into the stitch that falls below the chain 1 space. This way the ch-1’s get covered. 4.) Once you’ve worked your way around with the contrasting color, join the contrasting round and drop the loop. I like to pull it long so it won’t unravel as you’re working the next round. 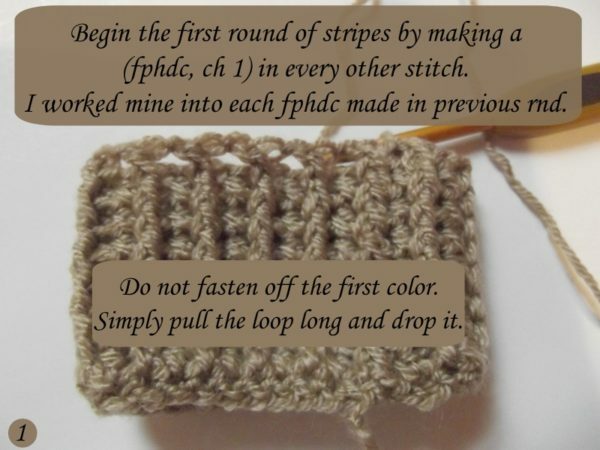 You could also place a stitch marker into the loop to ensure it stays put. Then go ahead and pick up your main color again. 5.) With the main color, (fphdc, ch 1) into each fphdc 2 rounds below. 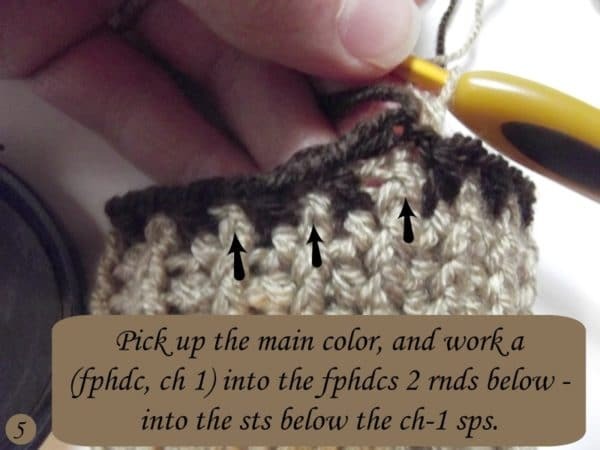 Refer to the arrow below, and note that the stitches fall directly below the chain-1 spaces. 6.) Continue to work into each fphdc around. Join the round and drop the main color. 7.) At this point you can pick up your previous contrasting color, OR, join a new contrasting color to the old one as pictured. I simply pulled my new color through the old contrasting color and began working around the posts of the previous contrasting color. Refer to arrow in image below. 8.) Continue in pattern as shown, working your main color on top of the main color, and the contrasting colors on top of the contrasting colors. Add as many or as few contrasting colors as you like. 9.) To carry the yarn, drop your last color and pick up your new color. The color you just dropped gets ignored and does not need carrying at this point. The only yarn you need to carry up at this point is any unworked yarn that sits below the color you’re picking up. 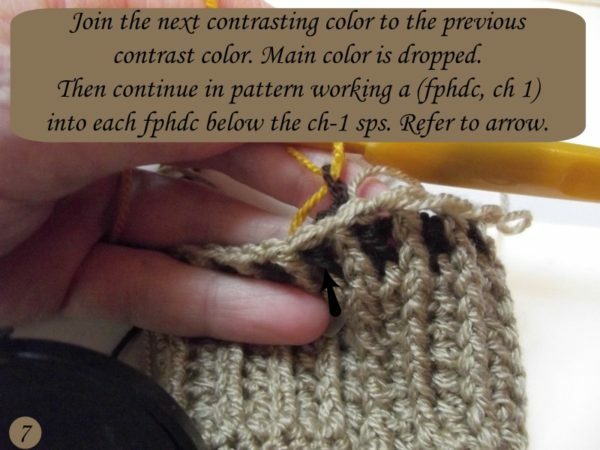 Bring that yarn over the new color that you’ll be working with as shown. Then simply chain one to secure. 10.) After you’ve secured the yarn with a chain 1, drop it to back so it doesn’t get tangled with your new stitches. And that’s it! Hope you have fun, and stay tuned for the upcoming patterns.